OXNARD, Calif. (AP) — Tavon Austin never really had a fresh start with a new coach in Los Angeles because of a wrist injury that plagued him and a hamstring that popped before the last of five disappointing seasons with the Rams. The eighth overall pick in the 2013 draft believes the opportunity has arrived through a trade to the Dallas Cowboys and the health that Austin hoped would come with it. Having something to prove is nothing new for the 5-foot-8 hybrid receiver/returner/runner. At first, Austin really didn’t know what to make of the draft-day deal that sent a sixth-round pick to LA. He had largely been a spectator when the Rams ended a 12-year playoff drought in the first season under offensive-minded coach Sean McVay. Austin’s first conversation with owner Jerry Jones boosted his spirits, and he later told reporters he was close to a recovery from ligament damage in his left wrist. 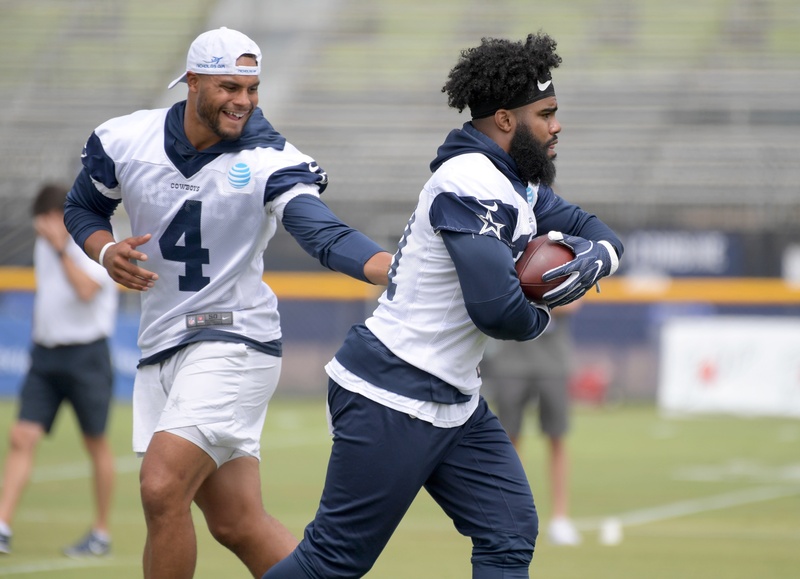 He hasn’t missed a day at training camp as part of a revamped group of targets for quarterback Dak Prescott. While he played in all 16 games for the NFC West champions with nine starts, Austin had just 13 catches for 47 yards. Most of his work was as a runner (59 carries, 270 yards and his only touchdown). Most of his time was spent on the bench. “Last year was the first time I had hit rock bottom dealing with an injury and the media bashing me saying I couldn’t do it,” said Austin, who had 1,689 yards and 12 touchdowns receiving and 1,238 yards and nine TDs rushing with the Rams, who were in St. Louis when they drafted him. Austin tries to stay out of the spotlight after practices at camp, only occasionally stopping for interviews. The 28-year-old is soft-spoken and reserved, but quick with a smile once he gets to talking. The Cowboys signed a pair of free agents in Allen Hurns and Deonte Thompson, dumped franchise touchdown receptions leader Dez Bryant in a cost-cutting move and drafted Michael Gallup in the third round, a day before the trade for Austin. The change of scenery offered Austin the rare chance to fill a leadership void despite being new to Dallas. Not only are the Cowboys likely to have four new receivers on the 53-man roster, they have a new coach at the position as well. The way Austin sees it, he didn’t get Lal’s attention by doing anything unusual. He’ll also take the role of coming out of the backfield — assuming that happens at some point. With almost as many carries (184) as catches (194) in his career, Austin figures to remain a hybrid back. The Cowboys just haven’t shown much of the backfield component in camp. Now Austin gets to try them with that elusive fresh start.